Support the growth of our next Picasso with these Natural Round Coloured Bristle Brush pack. This varied and economic pack size can either be distributed throughout your students or used by a single artist throughout the duration of their career. Designed for comfortable and secure use with smaller hands, the large and sturdy handles are easy to grip and move around for a wide variety of stroke types. 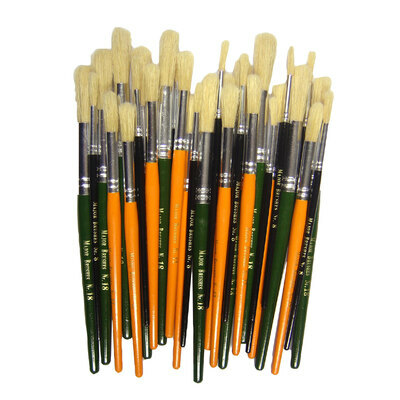 Each brush has been fitted with natural hog bristles that effectively pick up poster paints and ready mixed paints with a reduced risk of dropping. Ensuring that every single person within your class is equipped to participate, our bristle brush pack is sure to become an essential staple in your Arts & Crafts kit. Our Arts & Crafts category is constantly being updated with new and helpful resources for all environments. From our Economy Paint Palettes through to our own brand Gompels Ready Mixed Paint and our protective ChildrensPlay Apron in Red - and all for exceptional wholesale prices.